Peterborough Town professional Paul McMahon bowling to the club's latest signing Tim Young on East Midlands Twenty/20 Finals day in 2011. Peterborough Town have strengthened their line-up as they seek a fourth consecutive Northamptonshire Premier Division title. 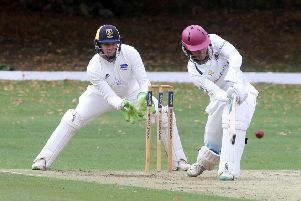 The Bretton Gate-based club have signed top-order batsman Tim Young, a former Nottinghamshire youth team player who has moved south with work and has ambitions of playing for Cambridgeshire in Minor Counties cricket. Young has experience of captaining his home club Wollaton in the Nottinghamshire Premier League and has had considerable success in the Twenty20 format. Indeed, he came up against Town in 2011 in the finals day of the East Midlands competition at Bretton Gate, taking the attack to seamers Ajaz Akhtar and Basharat Hussain in the course of scoring 62 off just 45 balls. Town start their Premier Division campaign with a home fixture against Wollaston on Saturday, April 25.